SALISBURY, Md. 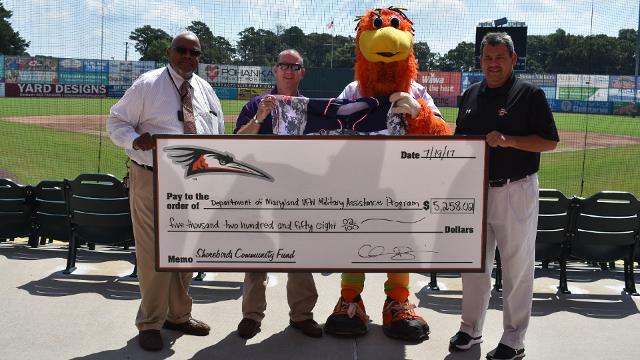 — The Delmarva Shorebirds are proud to announce the results from their July 4 jersey auction to benefit the VFW’s Military Assistance Program and Operation We Care, as the team presented a check for $5,258.02 at Arthur W. Perdue Stadium. Delmarva has more special jersey nights scheduled in 2017, including a Christmas In July jersey night on July 29, a Maryland Pride Thursday jersey auction on August 24, and an Orange Friday jersey auction on September 1. All three auctions will benefit the Shorebirds’ Fly Together Fund.